Gareth Bale is capable of replacing Cristiano Ronaldo as the star man at Real Madrid, insists Wales boss Ryan Giggs. Following Ronaldo's £105m move to Juventus, there has been an intense focus on who will step up at the Bernabeu and be the decisive player with the club linked to big-money moves for Neymar and Eden Hazard. 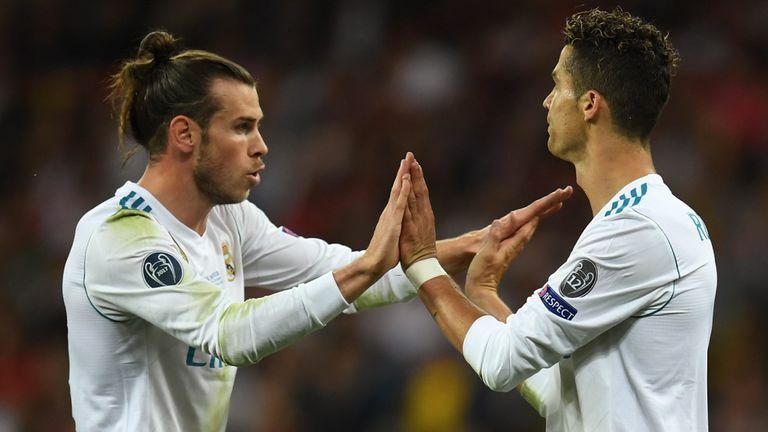 However, Bale has assumed Ronaldo's starring role in the Spanish capital since the start of the season, scoring in the first two games which have both ended in victory for new boss Julen Lopetegui. "When someone like Cristiano leaves there is always going to be a spotlight on who is going to replace him goal-wise and threat-wise," Giggs said. "Every year there is pressure on him and he has handled it brilliantly. "It's a bit different this year because Cristiano has left and there will be more focus on the players who are going to replace the goals. Bale, who became Wales' all-time leading scorer earlier this year surpassing Ian Rush's record, is part of Giggs' 25-man squad for the forthcoming UEFA League of Nation's fixtures against Republic of Ireland and Denmark. The former Tottenham forward has been blighted with injuries since his move to Spain and Giggs, who also struggled with his fitness as a player, is sympathetic to Bale's situation. "I think always the problem with Gareth is that when he has been injured, he's then had to come back and get more game time. "It was probably when I was 28 when I really started realising what was good for me," Giggs added. "Preparing for games, maybe not training as much or not as intensively and some days training more. "It's a fine balance. Some days if you can feel there is an injury around the corner you then pull yourself out of a game which isn't easy and you don't always get it right. "But it's something you have to try and do for the longer time that you are playing. Miss one game and play the next. "I was lucky having a manager like Sir Alex Ferguson who was quite happy to do that. "It takes time to know your body and get used to what is good for you."